The PLF Female Elbow connects tube at the angle of 90° with a male thread. Its thread connection involves BSPT1/8, BSPT1/4, BSPT3/8, BSPT1/2. The range of the metric tubing diameter includes 4 mm, 6 mm, 8 mm, 10 mm, 12 mm, 14 mm, 16 mm. The pressure of the product ranges from 0 to 10 bar while its temperature ranges from 0 up to 60° C. The thread is made up of a nickel-plated brass. Its sealing is precoated tapered male thread. 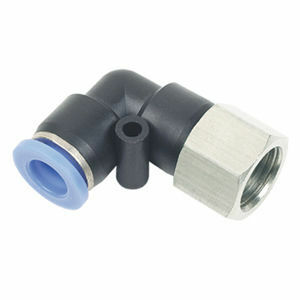 The product is suitable for air and vacuum and it is compatible with PU, PA, PE Tubing.